Dark magic monsters to enhance your game. Publisher's blurb: "Between the covers of the Midgard Bestiary for Dungeons & Dragons lurk more than 150 of the greatest monsters from Kobold Quarterly magazine and Open Design's award-winning adventures and sourcebooks - along with new threats you've never seen before. "Game Masters can use these monsters in the Midgard campaign setting, or add them to any fantasy world. 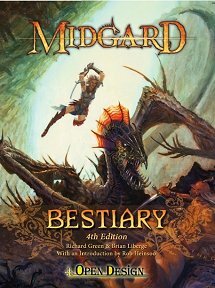 Get the Midgard Bestiary today, and unleash the dire weasels!"